Sadly, like many in my generation, much of my knowledge of Nelson Mandela comes from the movie Invictus, and most of my knowledge of apartheid from The Power of One (again the movie, not even the book). With so much history to learn and only so many classes, nations like South Africa and heroes like Mandela were relegated to the days when we talked about Those Who Are Not Like Us. Though it was in my lifetime I have no recollection of the end of apartheid. It’s a miracle I can even spell it without double checking. As we do with many elder heroes, we ran the danger of domesticating Mandela. One local station looped photos of Mandela dancing in his old age throughout their newscast. He could have been someone’s grandfather, tearing up the stage at the bingo hall. I suppose when a quote by an American self-help author is attributed to you, you have crossed some sort of Rubicon in the collective imagination. But he was young once, and dangerous enough that he spent long years in jail. Until seeing the following clip on coverage of his death, I realized I had never seen either video or photo of him before he was released from prison. Yes, he once was young and dangerous. Perhaps even angry, though he was cool enough never to show it. I can get that. I can do anger. The flipside of loving justice is hating injustice. The flipside of loving mercy is hating cruelty. Or at least many of us have been seduced into thinking, seduced by the heat of the flame of our rage, the smug satisfaction of our hatred of oppressors. Some people never find this anger, and I think they might have less turbulent lives than mine. My life is strewn with the hurts to which I have chosen to cling because they motivate me and those which I have let go. 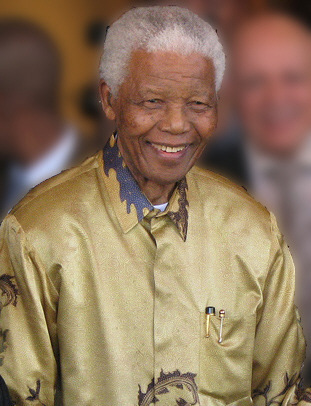 Looking at the life of Mandela, I see someone who let go of all of them. Even if the placidity was a savvy facade, he was able to conquer the anger enough to not let it show. And I don’t believe it was a facade. That is Mandela’s challenge to me. Keep the resistance that moves me forward while still loving the people who come in front of me. Be a force of peace without losing sight of the injustices that offend our very being because they violate God’s will for us. A good way to understand all of it on a deeper level is Desmond Tutu. If your bend is theology, he’s the bridge to understand much that helps to better understand Mandela. Tutu’s book on forgiveness is brilliant.